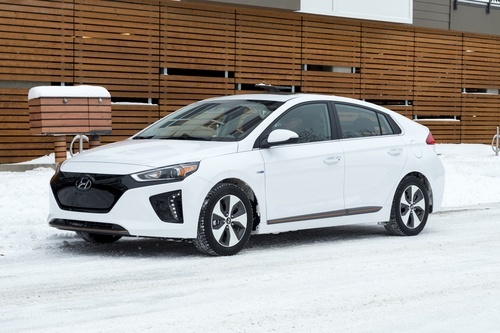 The exterior of IONIQ Electric is very similar to its hybrid brothers which have traditional looking grilles that air can flow through. 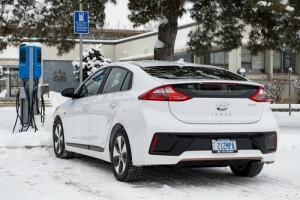 But the Ioniq Electric has no need to cool a gas-powered engine, because it doesn’t have one. It’s all electric and doesn’t need a grille. In its place sits a very smooth space-aged-looking black panel, and that’s just the start of what makes this vehicle special. Range and ease of operation have been serious concerns for many people when they think about switching from gas to electric. The fact is, that when you sit in an IONIQ Electric, everything will look and operate very much like any other car –only better. Its infotainment system is designed to appeal to customers with varied lifestyles. Drivers looking to integrate their smartphone will be able to control music, telephone or navigation functions on the vehicle’s screen through the Apple CarPlay and Android Auto features. 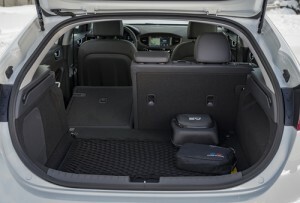 And IONIQ even offers a wireless inductive charging pad to ensure the occupants’ mobile phones are always charged. 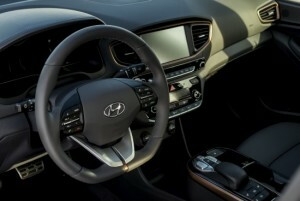 The hi-res (720p) 7-inch TFT LCD instrument cluster changes to suit the driver. In SPORT mode, the display shows a revolving digital speedometer surrounded by an analogue-style tachometer. In ECO mode, it simulates the familiar speedometer needle. Everything you need and want is available in IONIQ Electric and every feature is intuitive and genuinely easy to use. Hyundai’s commitment to advanced driver assistance and safety technologies includes autonomous Emergency Braking with pedestrian detection. At speeds over 10 kilometres per hour, the system will warn the driver through audible and visual signals and can provide full braking assistance to avoid or mitigate the severity of potential collisions. IONIQ is also fitted with Blind Spot Detection, Rear Cross Traffic Alert, Lane Change Assist, and a Lane Departure Warning System. Lane Change Assist goes beyond close-proximity Blind Spot Detection by looking further back in adjacent lanes for traffic approaching at a high rate of speed. Now for the big questions: How far can it go and how do you “refill the tank”? In IONIQ you can charge from home or work. You never stop for gas. Ever. On a single charge, the IONIQ electric model offers up to a 200 kilometre range of emissions-free driving. An integrated In-Cable Control Box (ICCB) is provided for charging Ioniq Electric in regular household sockets. Ioniq Electric also comes standard with an SAE combo-type charge port permitting Level 3 DC quick charging using compatible stations. And don’t forget about the provincial rebates available. Depending on where you live, government rebates of up to fourteen thousand dollars can reduce the initial investment dramatically, lowering or even eliminating another barrier for many buyers. So, don’t let a fear of the unknown rule out purchasing your first all-electric vehicle. Call now and arrange a test-drive in the 2017 IONIQ Electric. Chances are you’ll find it illuminating and maybe even… electrifying.